Father’s Day has become another very popular date in the greetings card calendar. This year it falls on Sunday 19th June, so if you haven’t bought a card yet you need to get looking and buying soon! It is a day to celebrate fatherhood and the greater role and influence of the father in today’s family and society. My designs for Decorque, celebrating Father’s Day have a nostalgic theme highlighting the old office – a time before the computer replaced the typewriter and the mobile phone over-shadowed the dial up. We look back on these calm, iconic surroundings, I think with a little regret, as we are now replicating some of those styles with new technology. My first card features the leather swivel chair, brass desk lamps and calendars, typewriters and Bakelite telephones, with a central antique gramophone. Messages saying ‘ It’s playing your tune’ ‘To the best Dad’ and ‘Celebrate’ are typed in spaces between the images. My second card has the office cork pin-board with messages pinned ‘Call Dad’; a notepad is also a reminder to call Dad on the antique phone to wish him a great day! The third card, with its antique look in tones of sepia, features a beautiful typewriter as its main image. ‘Happy Father’s Day’ is typed, heading a letter ready to send. The brass calendar says having a day off and the sign says at the front of the scene reads ‘To the Best Dad’. In a world of 24/7 it is a reminder for Dad to leave work alone and just enjoy his day! Many countries celebrate Father’s Day on the same day, the third Sunday in June. Germany celebrates it on Ascension Day, 40 days after Easter and call it Mannertag – Man Day. The U.S. Open Tournament is scheduled to finish on Father’s Day. Australia and New Zealand, I thought would be the same as the U.K. but they celebrate it on the first Sunday in September. 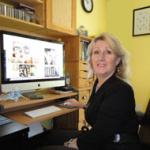 However, it seems wherever or whenever around the world, online and off-line retailers have now adapted by promoting cards and masculine gifts for the occasion. Here is a selection of other Father’s Day Cards I have found, which I think cover our Dads’ personalities! We all are aware how individual our Dads are, and I think the cards I have chosen cover many characters of those we know and love! 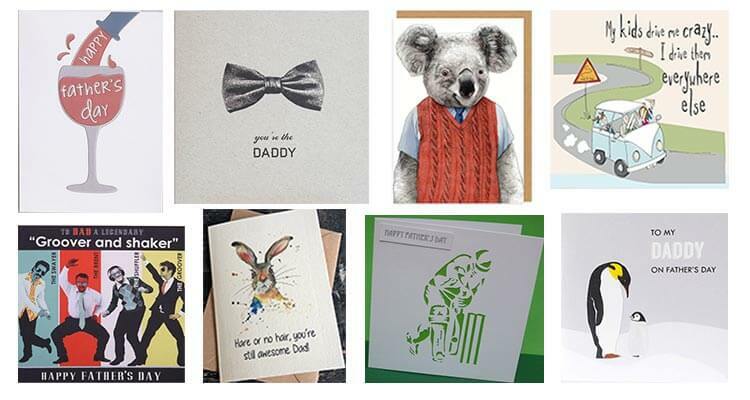 There’s a card by Raspberry Blossom for the Dad who likes a glass of wine; the smart bow tie by Studio Seed covers the traditional smart Dad; and for the Dad who has a wacky clothes sense- love the Koala in a Tank top seen on Oh Deer. 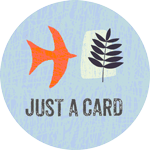 For Dads that still taxi the kids around, they will appreciate My Kids Campa Van card on Folksy, which says it all! We all know about ‘Dad Dancing’ and if your Dad fits the bill then this is the card for him from Clintons, it has all the moves! Many Dads are folically-challenged and if it isn’t a sensitive subject then this card, found on Etsy with its beautiful water-colour painting of a hare, is a great choice. Sport is always a popular theme – Nicklecards have a great choice of die-cut, sporting subjects – cricket, golf and football. My final choice is that Ah! card, perfect for children to send to Dad. With so many wonderful cards out there, with such diverse subjects and messages, I’m sure there is one to suit everyone’s Dad. Enjoy searching for that perfect card to make your Dad’s day!